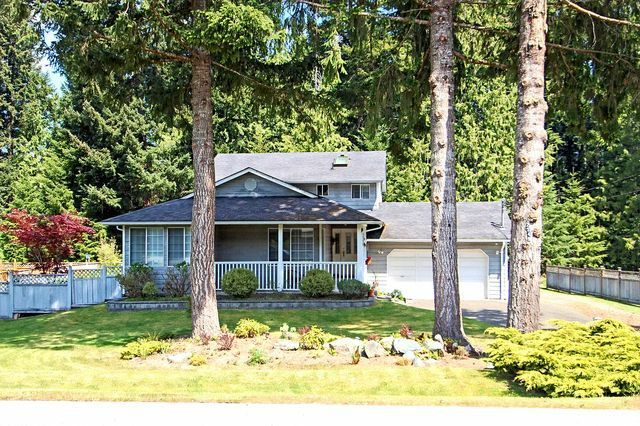 WITH GREAT CURB APPEAL ON A SPACIOUS .25 ACRE LOT, this 3-4 bedroom split level family home in popular Shawnigan Beach Estates has been very well maintained by the original owners, is on the market for the first time, and backs onto a green belt for extra privacy. There is engineered hardwood flooring in all living areas including the lovely living room, separate dining room, updated kitchen and nook along with a spacious sunken family room complete with a natural gas fireplace. The 4th bedroom/den, 3 piece bath and laundry room complete the main floor. Up are the large master bedroom with 3 piece ensuite, 2 more bedrooms and a 4 piece bath with new skylight. Off the family room is a great deck with grape arbour and a fenced back yard for kids or pets. Other features include modern fresh paint colours throughout, double garage, sprinkler system, HRV, built in vacuum and plenty of room to park the toys. Close to trails and an easy commute to Victoria, this is a great offering!